That’s my stock answer to this question: What IS the most beautiful airplane in the world? I just got back from EUG where we attended a Luau dinner party for the vendors at the Norwest Fly Fest to be held at Eugene’s Airport this weekend. As I strolled around the mostly deserted display and parking areas, I found myself equally drawn to the Columbia 400 and SR22 GTS as I was to a Cessna 152 with custom paint and a “Plain Jane” Tri-Pacer. This has got to be the deciding factor in determining if one is a true aviator, or just a person with a pilot’s license who converts dollars into altitude in an expensive toy. Aviators gawk at anything that flies – and are blown away each time we see an airplane break ground and FLY. We make pilgrimages to the middle of Wis-chan-sin to eat Brats and stumble around for days, walking sort of in a daze with jaws dropped as a new and even more exciting flying machine demands our attention with each new step. We give our planes names. Peggy was my last plane, Skyhawk two-niner-four-eight Uniform. Not sure why she was called Peggy, my wife just said so, and that, um, settled it. It was once said by Ernest K. Gann that you can tell if you’re in the presence of an aviator simply by watching his/her face when a plane flies overhead. In mid-sentence, if that person stops talking and stares in complete disbelief at how the plane stays in the air – watching it fly out of sight and sound before resuming the conversation – that my friends, is a true aviator. 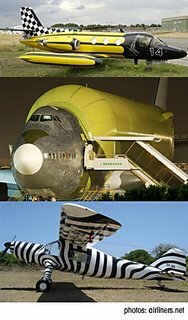 Go back to the top of this post now and take a hard look at the three airplanes I found on airliners.net (with BTW is the hottest aviation photography site on this planet or any other). All three look a bit odd, and yes, maybe even a little “beauty challenged”…that is, unless you are the pilot of the unidentified jet, the bulbous superhauler 747, or the wildest Pilatus Porter in Africa. If you really are a true aviator, then these are three beautiful planes. What’s it gonna be…ugly or beautiful? Are you a true aviator…or not?